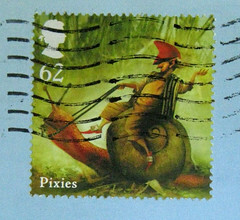 This fine postcard was another very pleasant surprise from Postcrossing, in the form of RU-1125795. 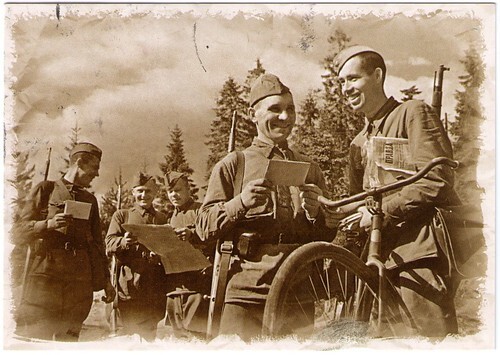 According to the sender, it shows a photo entitled "The postman hands a letter to the Red Army," from a set of "victory mail" released by the Russian Post "for the day of victory in the great patriotic war." You know I love any imagery of mail and mail delivery, especially involving mail carriers, and views of postpeople from other countries and eras always fascinate me. Plus, he's got a great bike! 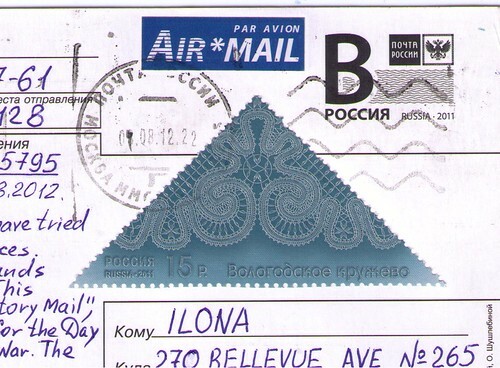 The sender, Yury, even included this awesome stamp showing Vologda lace. I think the thing I like most about this postcard is that it shows that the happiness mail brings is universal across time and different cultures. thanks for sharing it!